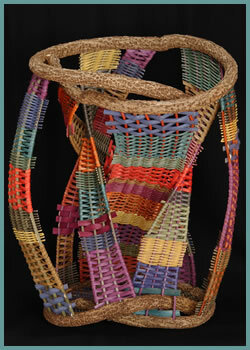 The free-standing sculpture styles pictured below can be woven for you in the size and colors of your choice. Tina always has some free-standing sculptures available for immediate sale. 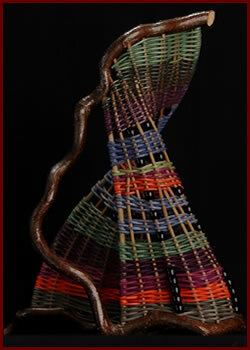 Please contact Tina directly to make a purchase or commission her to make you a custom free-standing woven sculpture. H 15" W 10" D 10"
One branch of “old man walking stick” was used to make this shapely sculpture. Then Tina wove into the elegantly curling piece of "old man walking stick" a pitcher shape, using reeds in the colors of light green, dark green, purple, blue, orange and plum. Accented with black wooden beads. H 24" W 12" D 12"
The top and bottom are separate pieces of bittersweet branch intertwined upon itself. Woven panels in a non-conforming shape connect the top and bottom. The panels are woven in a variety of colors: yellows, blues, pinks, greens, purples, etc.